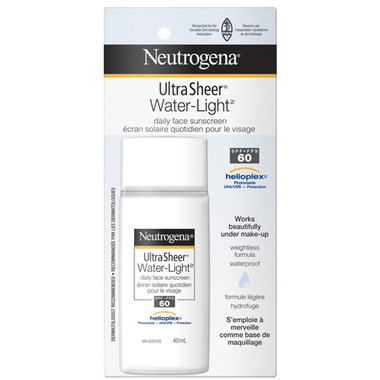 Get daily protection against sunburn with NEUTROGENA ULTRA SHEERWATER-LIGHT Daily Face Sunscreen SPF 60. This sunscreen has a water-light texture that spreads easily over skin, absorbing instantly to an invisible weightless feel. It features HELIOPLEX, an advanced sunscreen technology with broad spectrum UVA/UVB protection, which shields skin from the sun’s damaging rays. The dermatologist-recommended sunscreen is waterproof, oil-free and non-comedogenic. Use it alone or under makeup and moisturizers. This lotion comes in a 40-millilitre tube. Usage: Shake well before use. Apply generously prior to sun exposure. Reapply as needed or after swimming, towel drying, perspiring heavily or washing. Active Ingredients: Homosalate 10% (w/w), octocrylene 7.5% (w/w), oxybenzone 5% (w/w), octisalate 5% (w/w), avobenzone 3% (w/w). Non-Medicinal Ingredients: Acrylates/dimethicone copolymer, ascorbic acid, BHT, bisabolol, butylene glycol, C12-15 alkyl benzoate, camellia oleifera leaf extract, caprylyl glycol, cetyl dimethicone, chlorphenesin, cyclopentasiloxane, diethylhexyl 2,6 – napthalate, disodium EDTA, ethylhexylglycerin, mannan, neopentyl glycol diheptanoate, pantothenic acid, parfum, PEG-8 laurate, pentylene glycol, phenoxyethanol, polyester-7, polymethyl methacrylate, portulaca oleracea extract, retinyl palmitate, silica, steareth-100, steareth-2, styrene/acrylates copolymer, tocopheryl acetate, water (eau), xanthan gum. Caution: For external use only. Avoid contact with eyes. If contact occurs, flush eyes with water. Stop use if skin irritation develops or increases. If it persists, consult a doctor. Keep out of reach of children. Consult a doctor prior to use on children less than six months of age. Store at 15-30°C. I liked the idea of a lightweight, face-specific higher SPF, but I'm too oily a beast for this. If you have oily skin like me, there's a chance this won't be the best for your face either. While it didn't clog my pores (that I noticed, as I only wore it a few days), it absolutely caused me to become an even worse oil slick by noon. All of the makeup I'd applied over top of it (after letting it set while I did my hair) was sliding off. I went through more blotting sheets when I used this, too. I'll keep using it on my neck and chest until it's gone but definitely not on my face. This product is like a desperate attempt to recreate La Roche Posay's Anthelios XL sunscreen at a lower price point. If you are incredibly oily, you'll be able to tell as soon as you apply it that it's not going to work out. I can get it to 'set' on my face but all of the makeup I apply over it slides off before noon when I wear this. I'll continue using it for my neck and dÃ©colletÃ© but I will never put it on my face again. Back to the facial sunscreen drawing board for me. If your skin type is anything other than "extremely oily" or "combo with very oily spots," this might be a great option for you. Warning that it DOES have an artificial fragrance added, but it fades immediately. Perfect size to fit in purse. Sunscreen is lightweight and non shiny. By far the best facial sunscreen I've used to-date. It truly is ultra light and goes on beautifully. Will definitely buy again. The best sunscreen I've found by far. It has a high SPF, works under make up, and does not irritate my sensitive skin. In response to another review, it's not meant to be a moisturizer though, so I'd recommend applying it after moisturizer. And, a bigger bottle would be great. Best sunscreen I've tried to date. However, it makes your skin look slightly greasy, and doesn't moisturize enough if you have dry skin. Amazing, finally a good sunscreen for the face that doesn't feel like a sticky oil slick! Light, scent free and allows you to apply cosmetics without them clumping up. I do wish it was a bit more affordable and came in a larger bottle. During sun season you should be applying at least 2 times a day, three or even four would be better. Because it is a bit costly I find I tend to use it more sparingly than I should. However, all that said, this is a fabulous product. I am super sensitive to the sun and was getting sunburnt in 8C, so I tried the 110 and the 60. They both apply really easily and last a little longer than I expected. Besides giving me extra sun protection, I am wrinkle free in my late 60's. I credit helioplex for this. Excellent product, though a bit expensive. I love this product! It is the only face sunscreen that I've found where my make up actually still looks good at the end of the day. Not greasy or oily, comes out watery but you need to use quite a bit to get adequate coverage for sun protection. Slightly "sunscreenish" and stung a little bit. Not my fave daytime moisturizer. Not greasy, very easy to apply (comparing to Neutrogena Ultra Sheer Dry-Touch Sunscreen) but more expensive. If no financial concern, this one is higher in SPF and easier to apply. Both of them don't make the face look white. I recommend both of them. I found this very easy and effective to use. I've had no issues with this- and it's definitely protected my skin from the sun. This is the best sunscreen I have tried, and I've tried many. I wear full makeup every day and all other sunscreens are greasy, have a white cast, or have a strange effect on the makeup. If they could figure out a way to make it from healthy natural ingredients I would give it 5 stars. I don't agree with either the person who said this is hard to apply or the person who said this is like moisturizer: it is water weight, which means it's super-easy to put on and doesn't have a creamy, heavy feel. It disappears and you can't even tell it's there! I love this product, I don't know what I did without it. Yes, I do: I avoided sunscreen because I hate oily stuff on my face. I have sensitive, delicate skin and don't use conventional makeup, so for others with that issue this is an ideal product. Recommended by my Dermatologist to use daily, (she uses it under her makeup) and I have found it to be the only product that does not leave your face greasy. Love it. This is the best face sunscreen I've ever used. It feels just like moisturizer, and is the only sunscreen I've found that doesn't irritate my very sensitive skin. There's no sticky residue, so I can put on make up within minutes. Good product- squeezes out very fast and tends to be a little difficult to apply but it's an excellent product for your face.